Bellator Fighting Championships is losing one its champions. With no “champions clause” in Bellator contracts and his four-year deal coming to a close, Bellator middleweight champion Hector Lombard is leaving the promotion and heading to the UFC. “I am in the UFC it is official,” Lombard tweeted on Tuesday afternoon. Lombard is a big loss for Bellator, and a solid acquisition for the MMA juggernaut. Lombard is the only middleweight champion that Bellator has ever had, although the promotion has had a difficult time keeping him busy, primarily having him fight in non-title bouts. 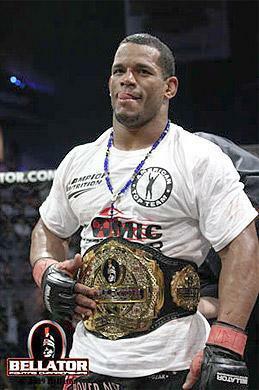 He’s also fought several times during his Bellator tenure for other promotions on his home turf in Australia. Lombard brings with him a 31-2-1 record to the Octagon. He hasn’t lost a fight since 2006, having when 20 consecutive bouts. No word yet on just when we can expect to see Lombard in the Octagon, but he’s sure to be a welcome addition to a division that is swiftly being cleared out by UFC middleweight champion Anderson Silva.